The sunlight glinted off that thing like the prisms we played with in 7th grade science glass. If you left it in the wrong place, it may well have burned the house down, so great was its power. 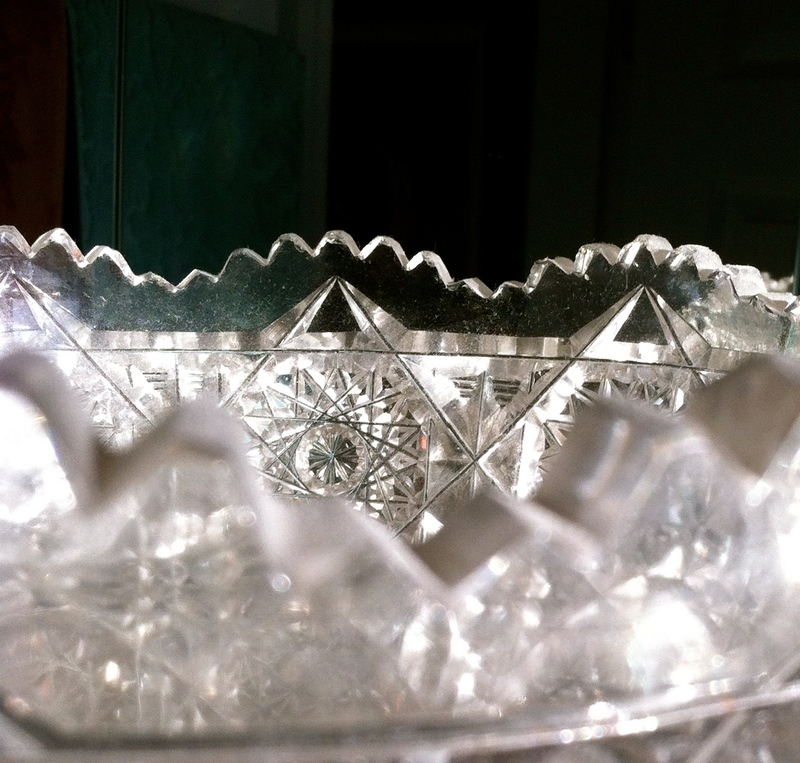 It was a crystal bowl from Ireland. Or was it cut glass? I never understood the difference. You have to cut glass to make crystal, right? So who cares? However it got the way it became, it involved skilled Irish craftspeople slicing and polishing glass. It had been in our house since I started reaching for things that were just out of my grasp. My Dad’s Irish immigrant mother had given it to my parents as a wedding gift. That was the earliest version of the story. The later versions involved her bringing it, and only it, with her on the boat as she made her way to New York from the bare potato field her parents decided held no future for her. In any case, it wasn’t until later when I really thought about it that I asked myself how or why an 11-year old girl would be charged with bringing a large glass bowl across the sea to unload it in the shadow of Lady Liberty, as if she had nothing else to worry about on this journey. If she was truly mygrandmother, she would have sold it immediately upon leaving the ship and gone off and bought herself a new pair of shoes. But I digress. That’s what we Irish do, we digress. Some people call it exaggerate, I call it digress. So this bowl, this prize, sat upon its perch on the little dark wood antique dresser for years collecting beams of sunlight but never my DNA. No one in the house was allowed to touch it. Looking at it was even saved for special occasions. How it was dusted and polished remains a mystery, since I never saw my mom do it, and I always carefully worked around it when I was earning my allowance each week. Imagine my shock and awe then, when I came home late one night during a college break and found my dad and his friend putting golf balls into it on the living room floor. My mom was out of town. With each resounding ping the little white ball made, they laughed harder and became more daring. I started drinking beer right along with them, but I couldn’t quite bring myself to take a shot at the bowl. It was enough just to watch them. I remember how much I enjoyed seeing my dad laugh so hard and look so handsome. When I do the math now, he comes out to be in his late 40s that night. They built ramps; they laid towels down for sand traps, and used tin foil to make the path to the bowl more difficult as the game went on. I went to bed before they were done. The bowl was exactly where it was supposed to be the next morning, looking deceptively untouched. And now almost every night I touch the bowl as it sits on the lower shelf of my nightstand, holding whatever book I’m reading. If you look closely, and the light’s just right, you can see the tiny chips along one edge. What a beautiful piece. And this essay's pretty fantastic too (I'll be here all week.) But, I digress. What I love most is that your family is you — your love of beautiful things, your mischievous streak and your inability to stop purchasing shoes. You are a marvelous writer. Thank you, Channy. I like when you digress. Thanks so much, Julie! How funny – maybe you should try the golf ball thing right after your next Thanksgiving dinner. Cranberry pear sauce sounds really good, by the way. Leave it to an Irishman to figure out how to golf and “bowl” at the same time. this is good. i have one of those bowls. it's in a drawer.